It’s been quite a while since I’ve shared a recipe here. It’s not that I haven’t been cooking, but my creative energies have been going into art rather than recipe-tinkering. This one though… this recipe I’ve been perfecting for more than a year. It started as a riff off a local grocery store’s rotisserie chicken rub. But I tinkered with the ingredients, the amounts, the application technique… and, well, I hope that you’ll agree with me that done right, this dish blows any store-bought and cooked chicken back to… well, the grocery store you bought it from. I call it “Sunrise” chicken, because when you layer the spices in the ramekin just so, they create a blaze of sunrise colors. This is a fairly complete meal on its own, but I like to include a hearty baguette loaf and a salad on the side. 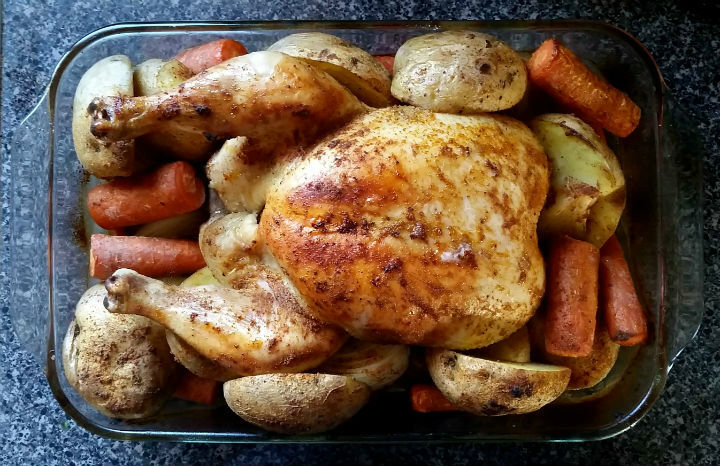 It’s perfect for a cold day – the smell fills the house and everyone is hungry by the time I pull out dinner. Better yet, I can boil the bones & drippings the next day for broth, and use up any leftovers to make a hearty chicken soup. Happy eating! *I’ve used this successfully with skin-on, bone-in chicken pieces as well. **I use Avocado Oil in my kitchen. It has a high smoke point and virtually no taste, and I love it. Use your preferred oil, but please take into account differences in temperature tolerance and taste when making the recipe. 1. Preheat the oven to 400 degrees F. Make sure your top rack is in the middle of the oven, with enough space above it to accommodate your chicken & pan. 2. Clean and prep veggies. 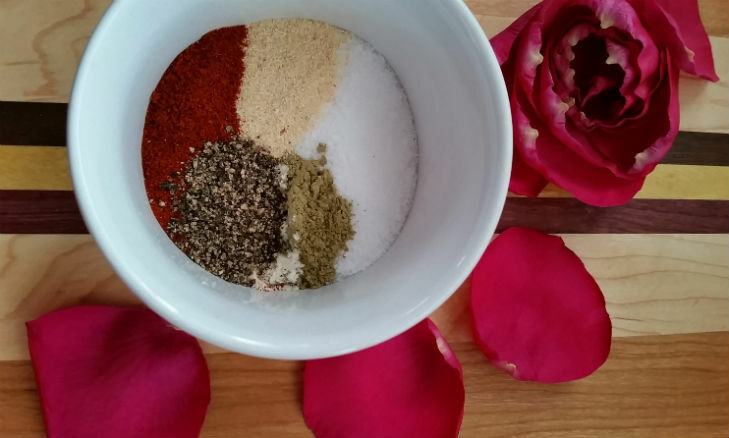 Combine all the spices into a single bowl or ramekin. Note: This amount of spice is just enough for a 4 lb chicken and the veggies as outlined here. 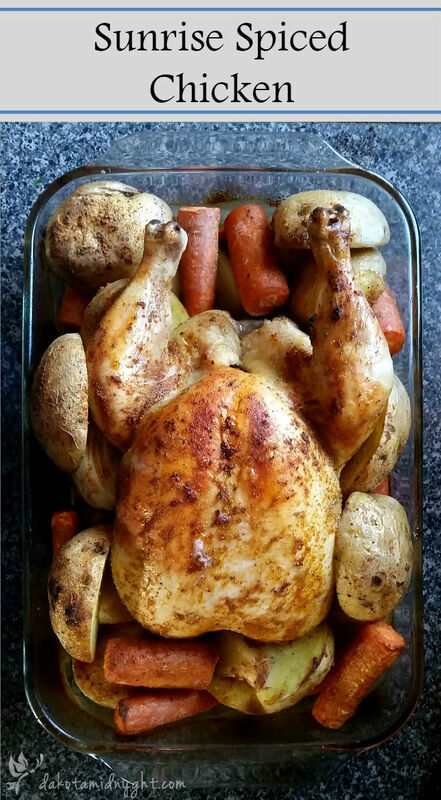 But, if you are omitting the veggies, you can do as much as a 7 or 8 lb chicken. If you are not doing the veggies, I find it much easier to combine the spice mix with oil (creating the texture of wet sand) before applying it to the chicken. Alternatively, divide the spice mix in half, mix oil with one half, and reserve the other half to sprinkle over the veggies later. 3. Drizzle ¼ – ⅓ cup of oil on the bottom of your 9×13 pan and coat the sides. Don’t hold back, you want lots of oil on the bottom so you don’t end up scrubbing hard later! 4. Clean out your chicken. (You know, remove the guts from the inside cavity, rinse it off, that sort of thing.) Let the excess water drip off and then lay the chicken in the pan, breast-side up. Method one: Take some of that oil from the bottom of the pan and oil the chicken down. 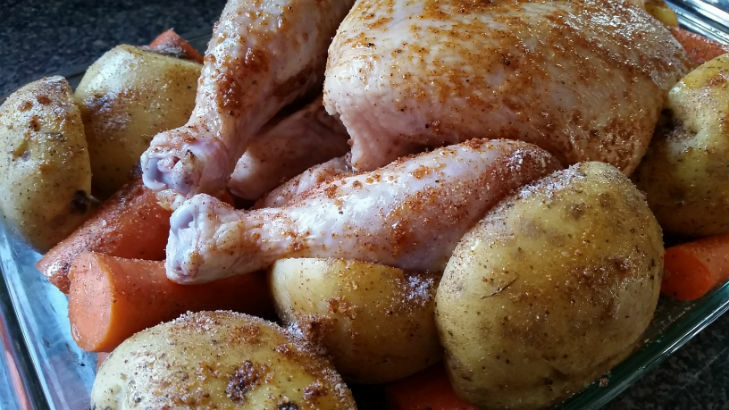 After oiling, take ½ to ¾s of the spice and rub it all over the chicken. The skin will turn a lovely red shade from the paprika. Tuck the veggies around the sides of chicken, and try to coat them with a little oil as you do so. Sprinkle the remaining spice mix over the veggies when you’re done. Method two: This method is easier if you have an oil mister, or prefer to drizzle oil over the chicken and veggies. Rub approximately half of the spice mix onto the chicken. Tuck the rest of the vegetables around the chicken. Mist (or drizzle) oil over everything. Sprinkle the remaining spice mix over the veggies. >>> The Key Takeaway: The chicken & veggies need to have a light coating of oil on them, regardless of how you accomplish it. The oil will pull out the fat-soluble flavonoids in the spice mix to make your dish scrumptious tasting. 6. Pour the ½ cup of chicken broth or water into the bottom of the pan. Broth is better, but water does in a pinch. Cover the whole kit and kaboodle with aluminum foil, and pop it all in the oven. 7. Bake for 60 – 75 minutes (1 hour to 1 hour & fifteen minutes). Remove the foil during the last fifteen minutes of baking for crisp, tasty skin. Make sure your chicken is done. Official recommendations are for the internal temperature to hit 165 F on your meat thermometer. 8. When it’s all over, save the bones & drippings to make broth. If you don’t want to make the broth right away, freeze it all for later. I use my homemade broth for chicken soup. The spices pull double duty and you barely have to spice the soup at all. This is my kind of chicken for sure. Will try it your way. Amen to saving bones! It’s so handy! I hope you enjoy it! I also use this rub for chicken pieces, you can just sprinkle it on and then mist with oil after. It’s still pretty tasty!